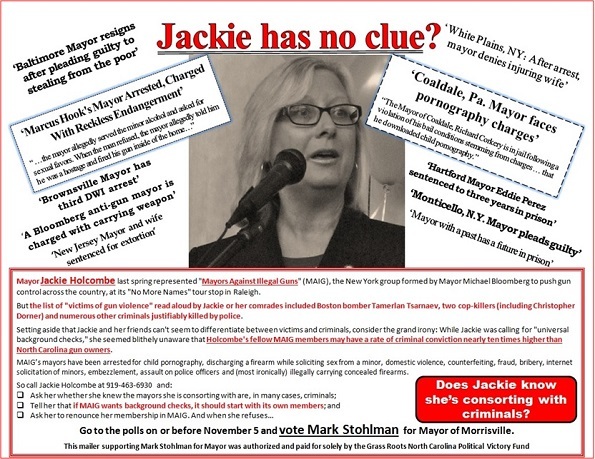 Morrisville Mayor Jackie Holcombe has been a vocal advocate of Michael Bloomberg's New York-based "Mayors Against Illegal Guns" (MAIG). In June, she spoke for the organization's "No More Names" tour stop in Raleigh, at which Grass Roots North Carolina turned out more counter-demonstrators than MAIG turned out demonstrators. As the November 5 election approaches, Holcombe will answer for her attacks on gun owners. Below is the mailing sent yesterday by the GRNC Political Fund to voters in Holcombe's district, detailing criminal connections within the organization for which she speaks. GRNC representatives will also be present for the Morrisville meeting tomorrow night at which Holcombe has vowed to flout state law by banning guns in municipal parks.